Last night after posting the blog entry and having plans for a relaxing evening of putting the babies to bed and catching up on some television. Instead Martin and Elliott launched into a fuss that would rattle the very foundation of our lives. It only lasted a couple of hours but we finally got to sleep around 1:00 AM, bewildered and exhausted. This was surprising since the previous night they'd had a record-setting seven hour sleep! Even last night, after the fuss, they slept for a solid six hours. Today they took quite a few unexpectedly long naps. 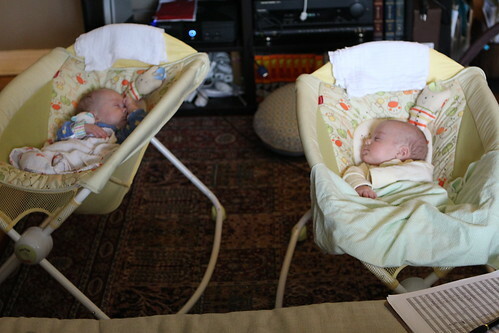 While this was good for my productivity it is a little scary because I wonder if they will just spend all night awake. 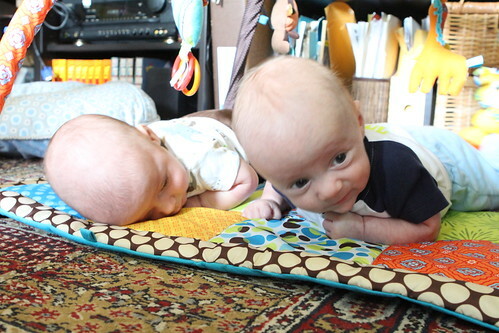 After naps I forced them into some tummy time. Elliott used to hate tummy time until he learned that you can treat tummy time as 'lie on your tummy and don't move at all time.' Since discovering this he has had a marked increase in his enjoyment of this morning activity. While the Wombats enjoyed their afternoon nap I got to work on dinner. 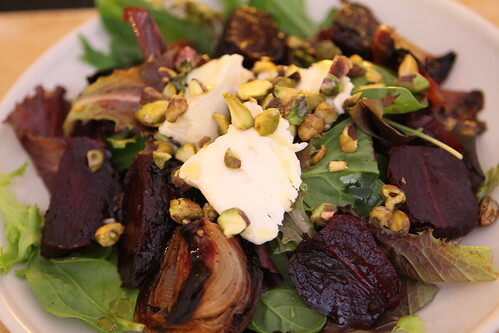 I started with this salad of roasted farm beets and onions, St. Nuage cheese, and toasted pistachios. I drizzled a little olive oil and honey over the top with salt and pepper. For the main course I took this "Jersey Arm" cut of beef short rib and seared it in a pan with onion, garlic, celery, potato, and chunks of pumpkin. 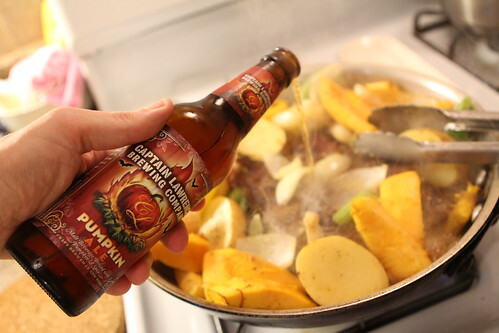 I added some Captain Lawrence Pumpkin Ale, and chicken stock before covering it and throwing it in the oven to braise for two or three hours. I took advantage of the braising time to bathe both the boys and get them ready for bed. They've really embraced bath time and only fuss a little at the very beginning if I put them down in their bath and they get cold water on them. In all fairness I would probably make a bigger deal than them of this if someone ever put my bare back against some cold water. In fact I'd probably punch someone in the face about it. Luckily the Wombats lack the kind of coordinated muscle control that would land me a knuckle sandwich. After bath time we enjoyed the short ribs which came out quite nicely. Of course it ended up being a little warm and humid today as opposed to yesterday's temperatures in the fifties. 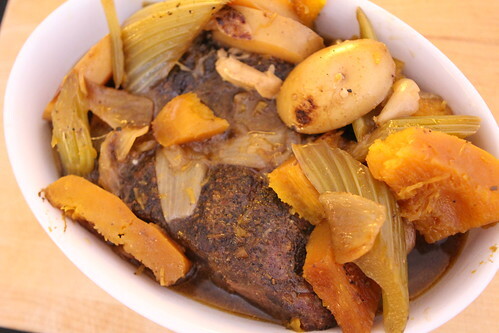 Braised short ribs weren't quite as appropriate as they may have been yesterday but we usually force the seasons based on our desire to eat seasonal dishes and my desire to use my seasonal beers in an appropriate way. Sometimes it's more the latter than the former. 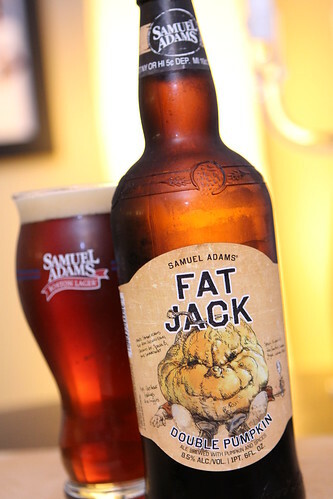 As an accompaniment I poured this Fat Jack Double Pumpkin Ale from Samuel Adams. In the scheme of pumpkin beers we've had so far this year this was at the top of the list. It was a rich, malty beer with far less obnoxious spice notes than some tend to have. I've enjoyed all of the Sam Adams Limited Release Beers so far this year and this one was no different. Here are the current pumpkin beer standings as I see them so far. And at that day number two of Mr. Mom has gone off without a hitch. We've tried not putting the TV on at all in an attempt to have a slightly less fuss-filled evening that last night. With a little bit of luck we will enjoy another seven hours of sleep and not have a three hour run of fuss leading to it. Only time will tell how wrong I am.